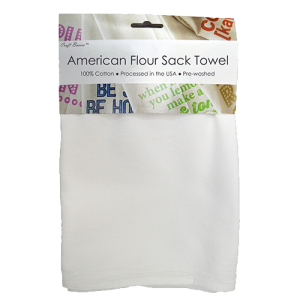 Cotton Creations is the best place across the web and retail chain for Craft Basics American flour sack towels! We proudly construct these essential wholesale kitchen towels here in the USA to ensure top-quality service and production. Order plain flour sack towels in any quantity, or take advantage of our in-house printing! 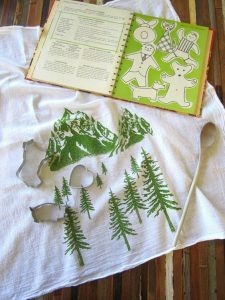 Back in the day, homemakers would stitch left over flour sacks together into clothing, sheets, kitchen towels and so much more. Today, we are still enjoying the classic flour sack towel material as home décor and as a trusted tool to accomplish, both easy and challenging, everyday tasks. Like those traditional flour sacks, these high quality towels are made from 100% fine woven cotton and sure to make your home or business more productive! We have so many jobs to get done throughout the week, and Cotton Creations wants to make each one of them easier for you. When you shop with us, your experience will save you precious time, money and spare you any hassle. Easily browse for your desired product and order any amount you please… no minimum requirement with us! Then, enjoy our discounted, bulk and wholesale pricing when you purchase as little as one dozen towels. The more you buy, the more savings you earn! Stock up your home and avoid weekly trips to the store for paper towels. Cotton Creations is your dedicated partner in home textiles, business supplies and cotton linens. The best part is you buy the towels once but can use them hundreds of times! Cotton is made to become a long-lasting member of your family or group. Made from the ground up, the Craft Basics American flour sack towels are as reliable as they are versatile. Simply toss into the washer to reuse and avoid buying paper towels over and over again. The flour sack weave is durable and absorbent to help get your chores done more efficiently, and without having to use disposable paper towels. One single flour sack towel can last for years with proper care, and can even be cut into smaller rags to extend their usability. The discounts don’t stop here. Check out our irregular flour sack towels for extended savings! These cloths do not meet the aesthetic standards for printing or clean blank orders, but are still made with high-quality fabric that is highly sought-after. These towels are porous and tightly-woven, perfect for those messy, hands-on jobs. The irregular American towels are the best option if you need painting, gardening, cleaning or craft supplies that don’t need to look perfect in order to get the job done right. They can even be cut into smaller rags to fit your to-do list! Keep them in your garage or under the sink so you’re always ready to go. These are sold at a discounted price to ensure you can stock up on cotton rags without spending big bucks. Save time, money and resources! Cotton Creations knows that manufacturing quality products means starting with quality fabric. We have worked with trusted suppliers and team members for over 30 years! We are an American, family-owned business that strives for 100% satisfaction. Shop with us for the best prices on Craft Basics American flour sack towels and experience the difference. The benefits of 100% cotton are endless. All of our American-processed flour sack towels are more breathable and absorbent than poly-blend fabric towels because the cotton works harder than manufactured fabrics. The low-lint weave construction is comforting on skin yet effective on any surface. Work with delicate items or use on hands and skin with the non-abrasive towel. Also, our cotton towels are pre-washed, dried and ironed. Our washing processes help to preserve the quality of the cotton, making it softer and preventing the towel shape and size from warping with high temperatures. We are proud to produce our American flour sack towels in Illinois. Wholesale flour sack towels are accessible to all of our customers because our production process is highly efficient. Our fully trained team takes careful time in inspecting the quality thoroughly. We are confident that you will find these towels highly qualified for food service, craft and home projects, health related uses and everything in-between. Our flour sack towels are of great quality and can be used for years to come in your kitchen and household. Trust the Craft Basics name for elevating your business and improving the cleanliness and comfort in your home. Nothing quite beats 100% cotton flour sack towels. Purchase a bundle pack of American processed flour sack towels and don’t worry about buying towels for your home for a very long time! You are sure to enjoy the soft feel and durability these towels provide indoors and outdoors. Cleaning spills, dusting and polishing your furniture just got a lot more convenient. Keep food fresh by covering up with a clean and non-chemically treated American processed Natural flour sack. No matter which line you choose for your brand or home, all of our flour sack towels are preshrunk, pre-washed and sterilized for your convenience. The 100% cotton backbone of our towels is completely durable and long-lasting, withstanding many washes and applications, yet extremely soft. 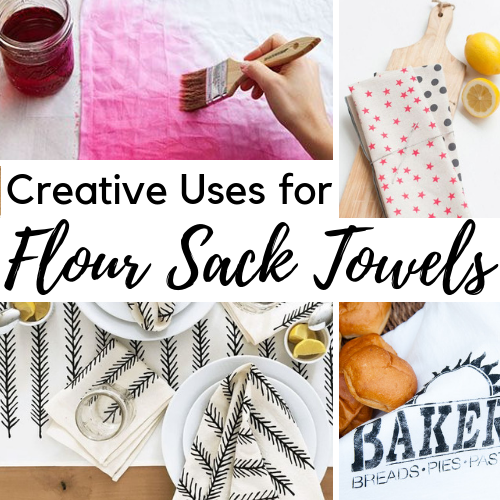 In addition to being completely lint-free, flour sack towels absorb liquids better than paper towels and, since Cotton Creations offers eco-friendly flour sack towels, you can help protect the environment with your purchase! We choose to offer flour sack towels that are processed in America so you can get a quick turnaround and the assurance that we oversee every part of production. A home essential and craft supply for generations, the cotton flour sack towel is both a timeless asset and a piece of history. These traditional towels are of the utmost quality and are thus extremely useful and long lasting. Proving their sustainability throughout history, flour sack towels are a versatile household necessity! Because our flour sack towels are safe around food, they have been used to proof bread, strain sauces, make cheese and dehydrate fruit. Lay down as a minimalistic platter or wrap goodies to-go instead of using plastic. The lint-free component ensures nothing is left behind in food, on skin or on surfaces. The soft 100% cotton flour sack material is non-abrasive on things like glass but can scrub tile again and again without giving up. Craft Basics American towels offer complete versatility that adds useful value to any kitchen or bakery. Chefs consider these towels “gourmet” and have sworn by them for years. y suppliers. Contact the Cotton Creations Sales Team to find out which Craft Basics flour sack towel is right for you. We are proud to offer American-made, sustainable flour sacks in three different lines: American, Natural and Premium. These towels are extremely popular thanks to their super high quality and have gained a sterling reputation in the food, hospitality and crafting industries. The quality of our flour sack towels is simply unmatched. First, the Craft Basics American is our famous crafting and cleaning go-to towel. This is made from 100% cotton that is bleached a bright white color. If you need a blank canvas for painting, stamping or branding your business, the American towel does not disappoint. The Craft Basics American towels are medium-weight and set the standard for custom printed towels across the nation. We have this line available in small napkin sizes, moderate kitchen towel sizes and larger utility sizes. You can bring a Craft Basics American into your home or work place and be prepared for anything. We include this superb towel in our 8 piece personalized kitchen towel sets, as well! 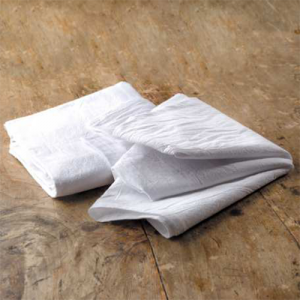 Also available in medium-weight cotton is our unbleached Craft Basics Natural flour sack towel line. 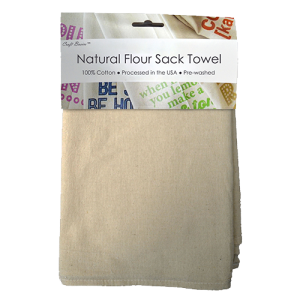 The original natural, eco friendly flour sack, the Craft Basics Natural towel gives a charming rustic element to your kitchen or bathroom. You won’t find beige flour sack towels at this quality anywhere else. We have perfected the eco friendly process of creating sustainable and functional textiles. These towels are key when working with food, children or animals as they have not been treated with harsh chemicals or bleach. Get your Craft Basics Natural flour sack towels wholesale without a special account or code. Ordering is super easy! If you need custom towels, the Natural flour sack gives any special event, party or housewarming party an extra special country touch. Lastly, the highest quality flour sack towel ever offered at Cotton Creations is the Craft Basics Premium flour sack towel! This is a newer line that has been perfected and brought in-house over the past year. We have fashioned a Premium quality flour sack with 100% heavy-weight cotton for high absorbency. These are elegant enough for a formal dinner party, but strong enough to handle lots of cleaning in the bathroom and beyond. The Craft Basics Premium towel is our most professional and sophisticated tea towel. Make a great impression on important guests or work clients with a crisp, customized cotton towel. Get the Craft Basics Premium flour sack towel wholesale for just a few cents more than the medium-weight options. 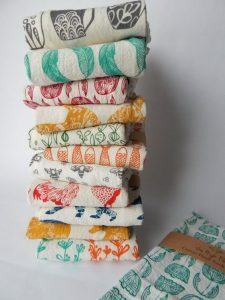 Order with Cotton Creations and get wholesale flour sack towels at a price that cannot be beaten anywhere! Get as little as 50 flour sack towels to save 60% on your order. Have enough to keep around the house, in the craft room and in the basement for emergencies. These towels are a great alternative to paper and other disposable products because they handle a variety of cleaning tasks while being entirely machine washable! When you need flour sack towels wholesale, turn to your partners at Cotton Creations! **Please note that processed in the USA means only the stitching, bleaching, washing, ironing, and packaging is done in the USA. The yarn is manufactured abroad.